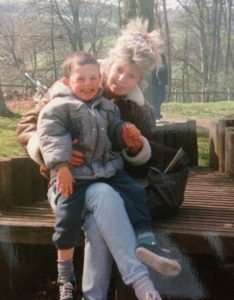 Dyslexia London sat down with Jamie McDonald, also known as Adventureman. He is the author of the book of the same title and a motivational speaker. He talks about self-motivation, resilience, power of connection and making a difference. 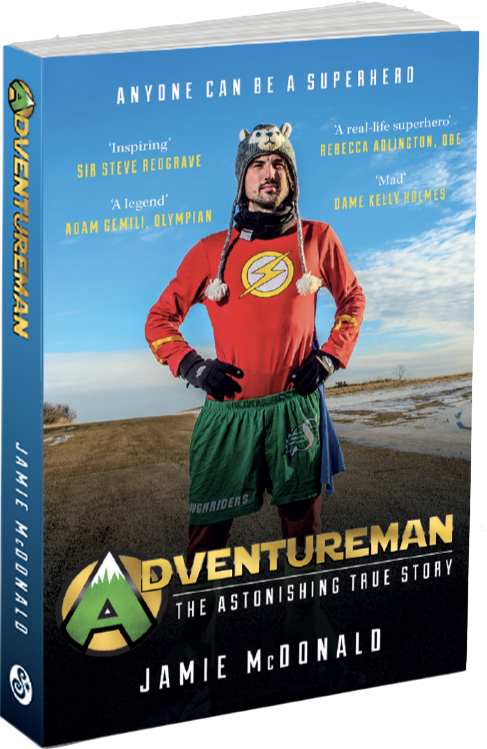 In his book Adventureman: Anyone Can Be A Superhero, he shares his life story from being a child scared he’d never be able to walk again, to become a Guinness World Record holder for Marathon Static Cycling. Q: Hi Jamie, Happy New Year! What have you got planned for 2018? A: Running 230 marathons across the U.S. with one year on the visa to do it. Oh dear. Q: Tell us about Adventureman – What is his most special superpower? A: Being able to put my body through pain and suffering by never giving up, and making a difference to others peoples’ lives. Q: Many people say dyslexia is their superpower, what’s your personal superpower? A: Throughout my years, knowing that I couldn’t write, or spell words that well, I’d often just say to myself, ‘I’m thick’ or ‘I’m stupid’. This actually put me in good stead for life, as I knew I had to survive in the world in other ways, like being good with people, being very sociable and connecting with people. Q: Were you diagnosed with dyslexia at school? A: Unfortunately, I think I just about missed out age-wise on teachers understanding more about dyslexia and learning difficulties in general. I was always just told that I should try harder, which made me feel even worse. I’d left school before it was even mentioned to me as a possible issue, but I’d always known I didn’t learn as other children did. Q: You’re very vocal about how your health challenges have contributed to the life you lead today and motivate you to give back. How has living with dyslexia affected your childhood (and adulthood)? A: So, I had a teaching assistant throughout my school years, but still didn’t pass my G.C.S.E exam at English. I put this down to ‘I’m thick’. I did go back to school at 23 years old to retake my English G.C.S.E exam. I actually sat in the classroom with the kids. During my time studying, I couldn’t spell even the simplest words, which was pretty embarrassing. Eventually, I opened up to the headmaster about my worry (who gave me the confidence to retake it in the first place) and he made me aware that I was most probably dyslexic. Throughout the journey, a fair few people made me aware of it too. I still struggle to this day. As embarrassing as it was at the time, once the headteacher and others made me aware that I had dyslexia, I stopped giving myself such a hard time at thinking I was ‘thick’ or ‘stupid’. It was a great relief in the end. He explained I’d just have to work my socks off if I was going to pass my English G.C.S.E. So I did. I spent all my time working alongside the teacher that was helping me through to get top marks in my coursework, and then even if I didn’t do well in the exam (which I didn’t) I’d still pass. I managed to get a B. It wasn’t the best, but it was a pass. I was really proud. Q: Congratulations on writing a book! Tell us how it came about. A: After all my adventures and so many stories to share, it was time to write a book. An adventure friend connected me up with a publisher and once they said ‘you have to do this’ – there was no turning back. Q: Did you find your dyslexia helped or hindered the writing process? A: I think it slightly hindered me in the writing process. I’m so slow. My confidence isn’t great. But, I’d learned from my time at retaking my English G.C.S.E, if you just give it your all, you’ll get there. Though, as soon as I use a pen and paper, I’m doomed. I can’t spell a thing. BUT, the best thing that helped to write the book, is using a computer. It’s amazing. I find if I get a word spelled near to the word I want to write, it often knows what I want to write and spells it for me. And if it doesn’t, then I’ll keep googling until I find the word and its definition. Also, having a professional editor to help with spelling and making sense of my sentences after I brain dumped everything out of my head really helped too. I’m never going to be an amazing, or perfect writer, but there will always be people that can help. Q: What’s been your greatest challenge so far? A: Sounds silly, but running 230 marathons and losing part of my nose through frostbite in -49C was probably easier than writing the book. It was PAINFUL and so CHALLENGING writing the book. However, like any great challenge, it can often be the most fulfilling. Q: What’s the wildest adventure you could imagine yourself doing? A: Running 230 marathons across the U.S, which starts in soon. 10th April 2018. Eeeeek! Q: We’re very intrigued by the static cycling challenge- How did you sleep/eat/ etc.? A: Every hour you cycle, you accumulate a 5-minute break. So, if you cycle for 24hrs, you have a two-hour break to use if you want to. I managed to take a 1.5hr sleep cycle every night and sustained that over 12 days. I ate on the bike. Peed on the bike. I used the other 30 minutes for the number two. Sorry to be gross, but you did ask. Q: Can you tell us a little bit more about your latest adventure and how people can support you? A: Here’s all the gory details about the next adventure: (https://www.jamiemcdonald.org/super-u-s-run/). Donate: If anyone would like to make a donation to the Superhero Foundation, a charity that I co-founded and volunteer my time with, helping sick kids, will make a big difference. You can donate here: (https://www.superherofoundation.org/donate/). Or, please do take on your own challenge, I’d never expected anyone to run across a country, but doing a sponsored 5k walk, cake sale, it all adds up and makes a big difference. That’s why I think anyone can be a Superhero! Book: Also, buying my bestselling book (get me! ): Adventureman: Anyone Can Be a Superhero makes a difference too as I’ve put 100% of the royalties to Superhero Foundation. You can buy the book here: (https://www.superherofoundation.org/book/). Follow on Social media: Following along and sharing the journey really helps too. Finally, if you know anyone in the U.S, let them know I’m coming! I’m doing it solo, just me and a pram (no baby of course), so I rely on people to help me through. If they want to bring me a hot coffee or throw me a banana, that would be lovely.